Combine Wind, Fire and Water elements to create the force of nature in the 5-reel 3-row 25-payline Asian-themed video slot machine produced by Red Rake Gaming that comes in both free play and real money modes. 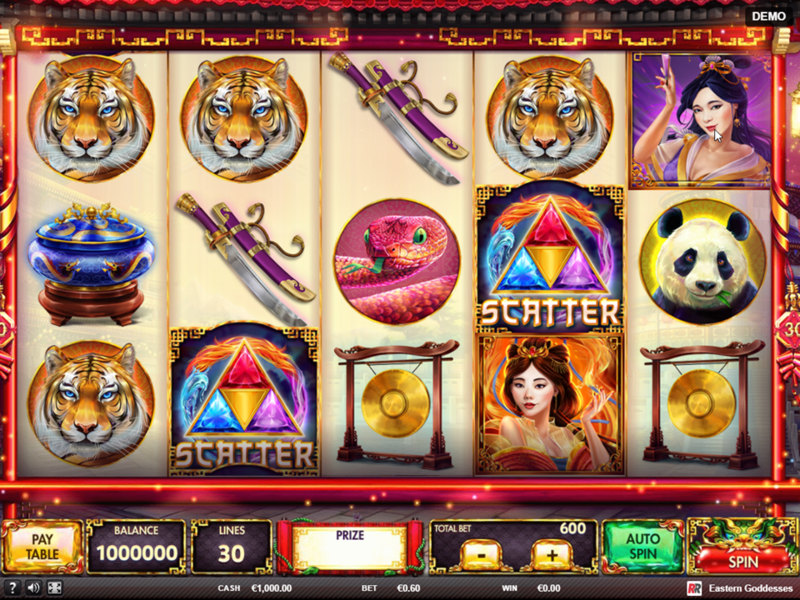 You’ll get a chance to land a big win with the Free Spins, Fire Multipliers, Wind Fortune, Wilds and the Divine Bonus game, so read the Eastern Goddess slot review to learn a set of tips that will be more than useful when you start to play online. Unfortunatly, we have no free play mode for Eastern Goddess available. Check out the screenshots below and hop right into action with one of the recommended casino sites! Wild can replace a missing symbol from a winning combination, but also bring 1000 coins on the paytable for a combination of 5 of the kind. Three goddesses are symbols with the highest rating and may appear in normal and full size. The Fire goddess acts as a Wild and grants a 2-5x multiplier, Water creates a Waterfall and turns randomly selected icons into Wilds, while the Wind combines a column filled with Wilds and 5 free spins. The coin value goes from €0.06 to €195, meaning you can place 60 to 195.000 coins per spin, according to your betting strategy. With 3 or more scatters, the winners will trigger the Eastern Goddess Free Spins round and start determining the actual number of spins through the Divine mini game. Your task would be to complete the entire image of a goddess and thus earn 8, 9 or 10 extra rounds. As a recently launched title, the game maintains full mobile compatibility and makes it possible to play for fun or for cash directly from a browser. There is no need to download an app for Android and iPhone. 3. What is the RTP factor of Eastern Goddess? According to the official info, the expected RTP is approximately 96.00% and is unlikely to vary on the Red Rake Gaming powered sites. A variety of betting combinations, interactive bonus rounds and a pack of rewarding features make this game interesting to a wide range of gamers. Hopefully, you won’t mind the variance, since there’s a lot to be scored here.